Geotech Environmental Equipment, Inc. Receives ISO 9001:2015 Certification with Innovative Lean Philosophy Mashup. 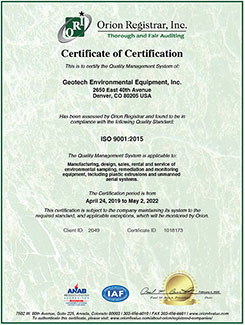 Geotech Environmental Equipment, Inc. a manufacturer of equipment used for environmental sampling, monitoring and remediation as well as injection molding and thermoplastic extrusions for OEM's, announces that they have been certified under ISO 9001:2015 as of April 20, 2018. The company previously earned certification under ISO 9001:2008 in 2013 and has been audited and registered annually by Orion Registrar, Inc. Geotech's innovation which blends existing lean concepts with the ISO 9001:2015 Standard requirements created a seamless management strategy which accomplishes both while increasing value for customers. "This new Quality Management System (QMS) reflects our commitment to quality and our drive to consistently eliminate waste in all aspects of our operation, not just production. By incorporating the ISO 9001:2015 standard into our harmonized format for communication, tracking issues using metrics and creating projects to continually improve, our business improvement team has sliced away waste that does not add value for our customers," said Jeff Popiel, President and Chief Executive Officer. "Both systems use similar tools and principles to drive continuous improvement. It just makes sense fundamentally to combine the concepts into a comprehensive system." For any company, the road to certification requires time and commitment. Geotech began their internal preparation for certification in May 2017, by evaluating their existing procedures and aligning them with the new requirements. While their documentation and procedures were already well established and compliant with ISO 9001:2008, they recognized an opportunity to streamline processes to combine the philosophy of lean while complying with the ISO 9001:2015 Standard. As an example, the ISO 9001:2015 standard includes assessment of risk throughout all processes of the organization. This was accomplished through the addition of risk assessment during daily communications by teams and during management meetings. ISO 9001:2015's management review requirement was addressed through daily gemba walks by the business improvement team. ISO 9001 certified since 2013, Geotech has 122 employees worldwide. They have been a leader in the design, manufacture and distribution of ground water sampling, monitoring and remediation equipment since 1978. State-of-the-art manufacturing, machining, thermoplastic extrusion, contract manufacturing and injection molding capabilities allow Geotech to innovate cost-effective solutions to tough environmental problems for its extensive government, consulting and private industry customers. Leptron Unmanned Aircraft Systems, a division of Geotech, manufactures and distributes patented, unmanned technology which can be piloted remotely using advanced ground station products. Leptron's unmanned aerial vehicles (UAVs) are certified for airworthiness, manufactured in the USA, and include pilot training. Geotech has products in 100+ countries including Brazil, Australia, Chile, Mexico, the UK, the Netherlands, and France. In addition to nine domestic offices, Geotech has satellite offices in Spain and China.